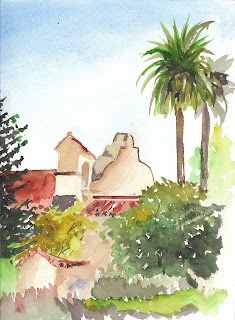 I went to the SCVWS plein air paint site in Los Gatos last Thursday; only about a half dozen of us showed up, but it was a nice day and there's always plenty to paint there. I began on the corner of Santa Cruz and University Avenues, looking across the street at the La Canada Building-the bottom picture. I went in and added some black pen, but the point was too bold, I think. 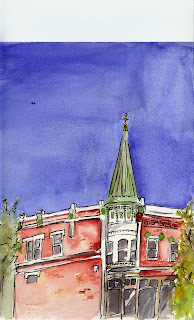 Next, I walked over in front of Old Town and did a quick study of the church next door-the top picture. I had pretty good luck with the layered foliage, which is one of my big challenges, and one I force myself to deal with frequently. Both paintings were completed in a bit less than 3 hours total. Janice, very nice pieces and they really "say" Los Gatos to me. Nice work!